The other day I discovered a book titled African Interior Design lying on my shelf. There were TOO many wonderful houses, really really inspiring, but one just took my breath away! 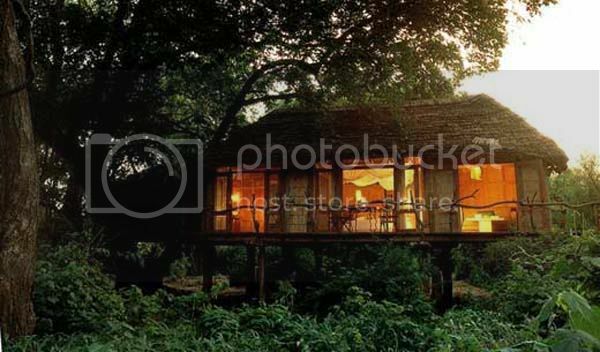 The one I'm talking about, is the Lake Manyara Tree Lodge, in Tanzania. 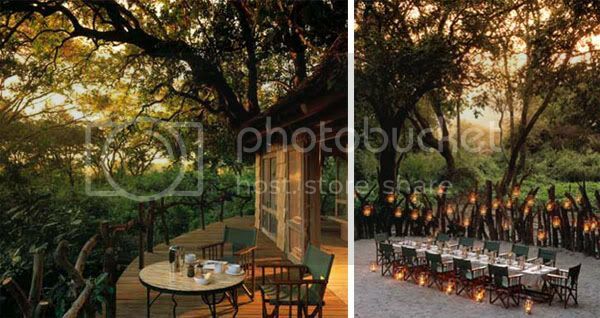 Lying in the heart of a mahogany forest, the lodge is the only residence situated inside the Lake Manyara National Park. Built literally in the trees using local wood and palm fronds the loudge blends harmoniously in with the surrounding forest. It's warm use of colour and illumination rends the rustic decòr elegant and most of all intimate. Vast windows enhance the view of the lush vegetation outside. It's like a perfect-tree-house dream come true. Plenty of privacy offering romantic bedrooms are connected to the big terraces which are perfect for enjoying the sunset after a long day of possible leisure activities (safari, bird watching, long walks and picnics near the lake). After one should not say no to a relaxing hot outdoor shower under the enchanting and immense african sky to finish the day. Delicious home cooked cuisine, which served every night at open dining boma, can be learned first hand from the cooks. I would say a dream place to go on a honeymoon! Issand ma armastan selliseid puumaju! Ma võiksn vabalt elada kuskil vee ääres sellises hubases majas!! haha sa kõik välja juba uurinud! aga honeymoon'i eest maksaks küll või mis? tegelt vist ikka. Koguks ja siis naudiks tàiel rinnal!